Edinburgh Yarn Festival (EYF) has grown into one of the most high-profile yarn events worldwide, attracting visitors from across the globe. 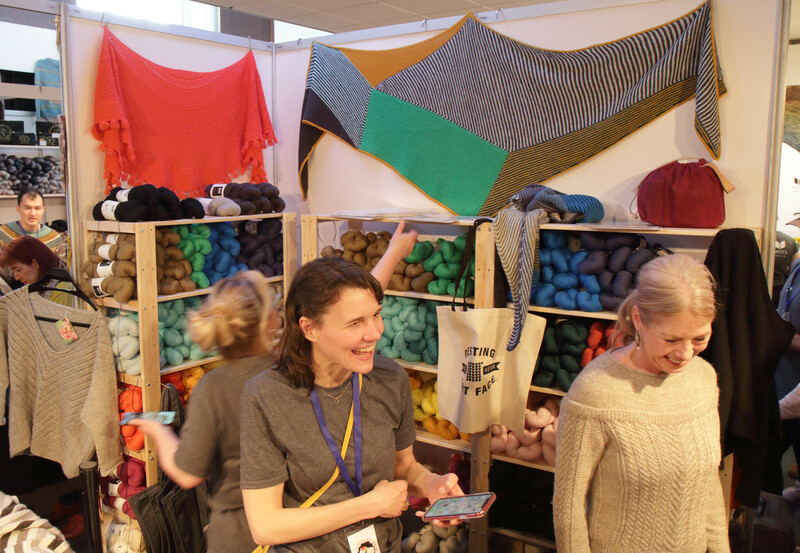 This year I travelled to the show for the first time to absorb yarn fumes, catch up with friends old and new and be inspired. First stop was The Wool Kitchen. [Yep, the irony is not lost on me that I travelled to Scotland to see a dyer from my East London neighbourhood!] 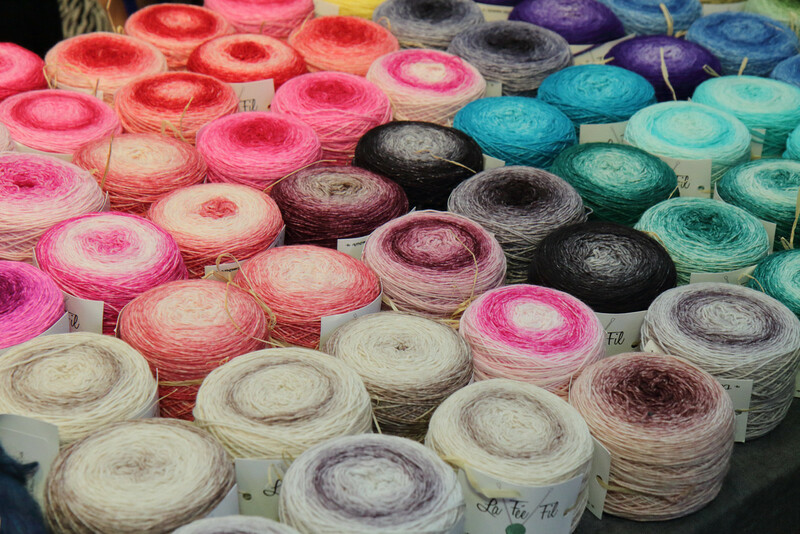 Not only did she have a booth full of pretty yarn, but some samples that really caught my eye. The Riverside sweater by Mrs Buttons caught my eye immediately. 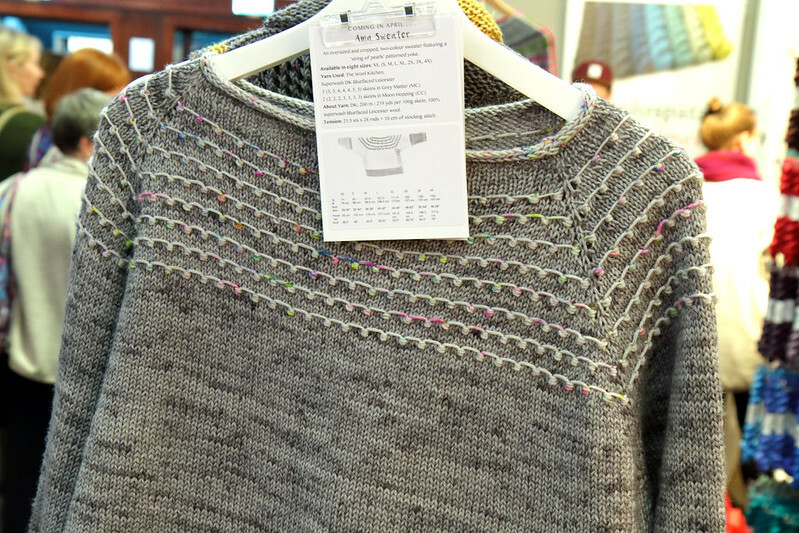 I can’t think of a time I’ve seen a sweater with a more innovative construction! If you’re already by familiar with Maddie Harvey’s Ama shawl, you’ll be pleased to hear the sweater version is coming soon! I tried this one on and it’s going straight into my queue. 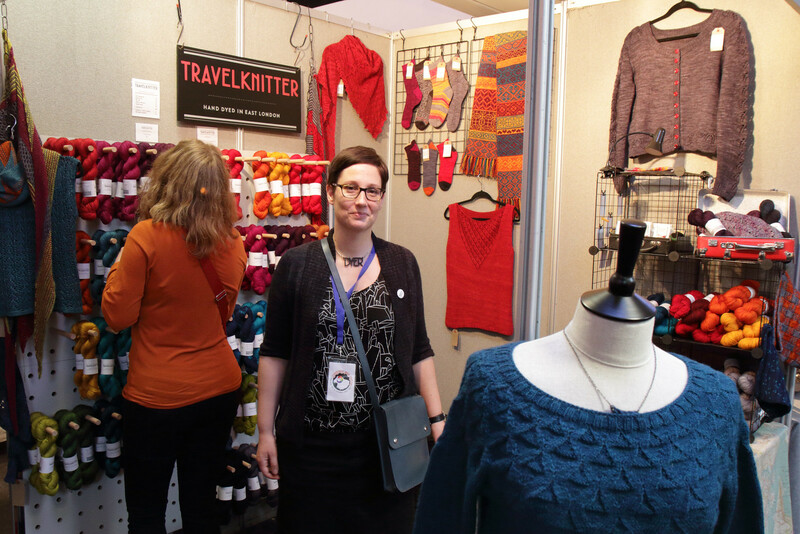 Next I visited my other Walthamstow dyer neighbour Travel Knitter, seen here being decidedly unimpressed with me insisting she be in the photo! Her Kirigami pullover (on mannequin), made especially for the show and finished by the skin of its teeth, looks fabulous in her Dabbling Duck shade. 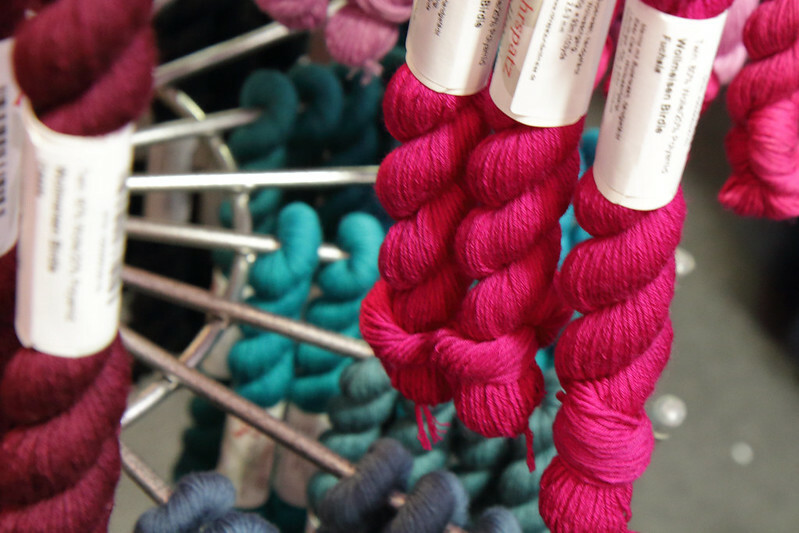 Larissa produces a new shade especially for EYF each year, and this year’s is ‘Morar’, a stunning silver grey with magenta speckles on luxurious Merino Silk 4 ply, inspired by heather flowers. If you want to get your hands on this one, I suggest joining her mailing list as she’s planning to produce a special extra batch. 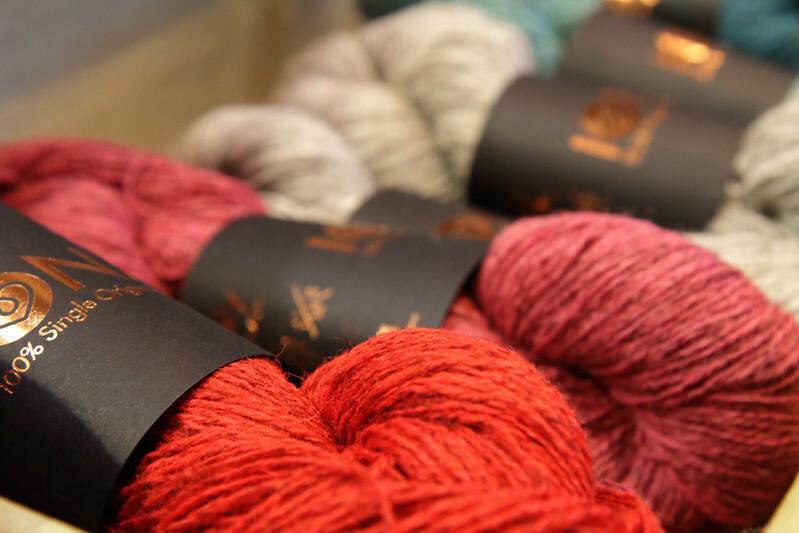 Now for a new discovery from a little further afield, Le Fée Fil is a French indie dyer with a beautiful selection of gradient yarns in large 200-300g cakes (one is enough for a large shawl). 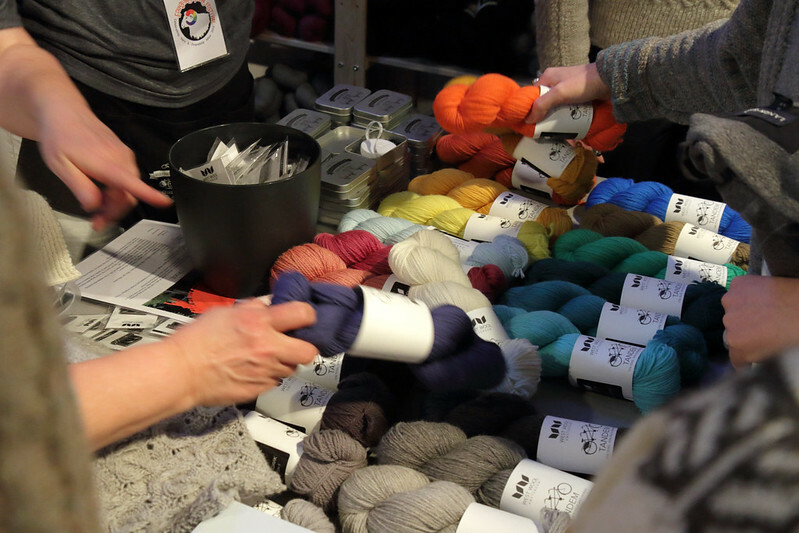 If there was one thing I was most excited to see it EYF it was the single-origin wool yarns, of which there were many to choose from but my absolute favourite was from Uist Wool, a small mill on the isle of North Uist in the Outer Hebrides. 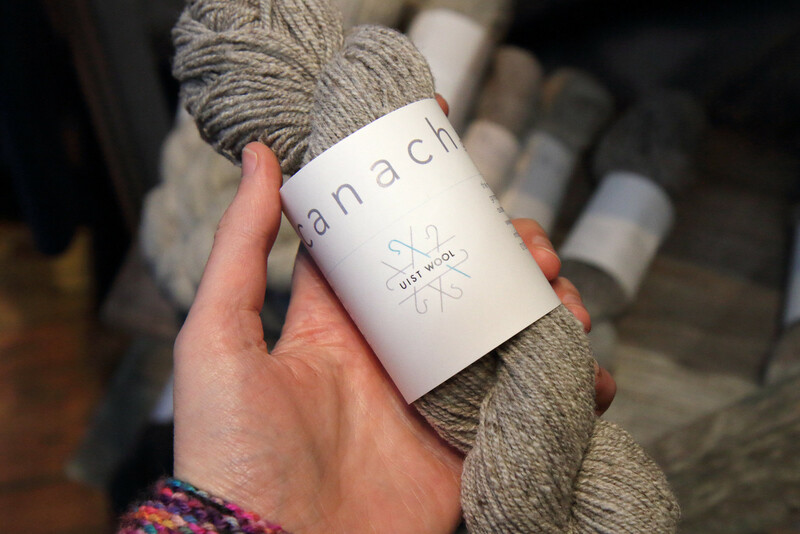 Uist Wool’s Canach was a very unexpected find. 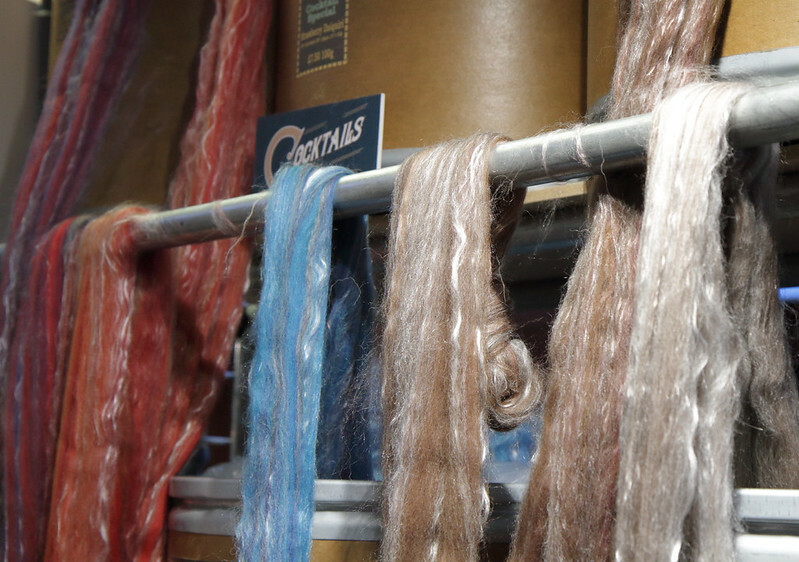 It’s a Scottish Merino (Shetland and Saxon Merino cross) with a very fine fleece, unique to hardy sheep. It’s available in a range of natural ecru, oatmeal and grey shades, and has an amazing sproingy quality I have not felt before in a sheepy yarn. 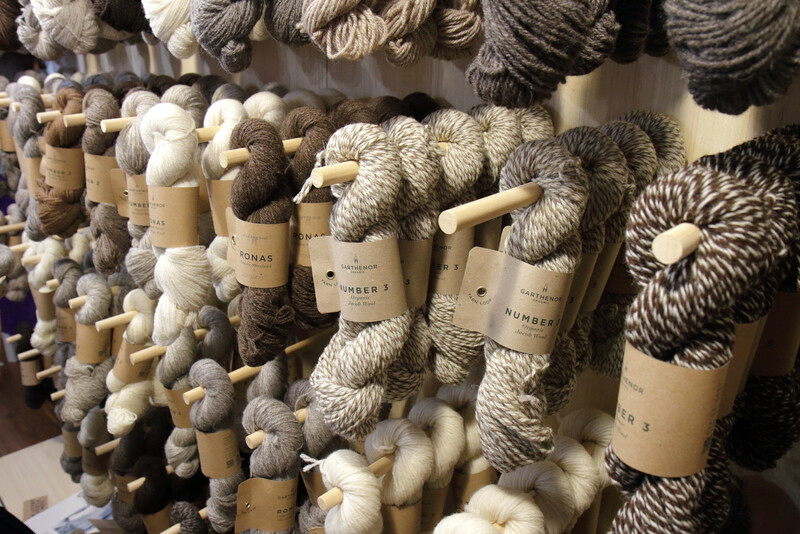 I love the look of these natural British yarns but normally find I can’t wear them against my skin but I would not hesitate to use this for a scarf or cowl. 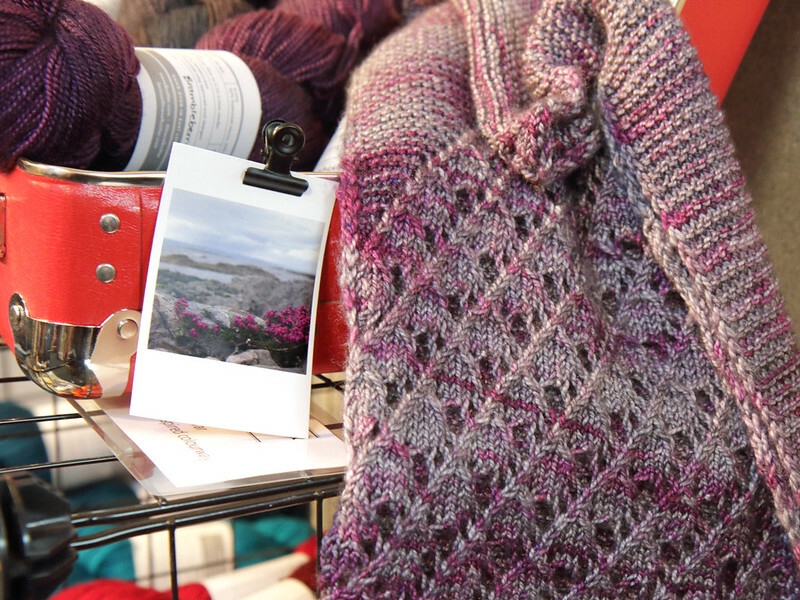 Uist Wool have a new clip of this yarn arriving on their website 1 April – I will be setting a reminder! 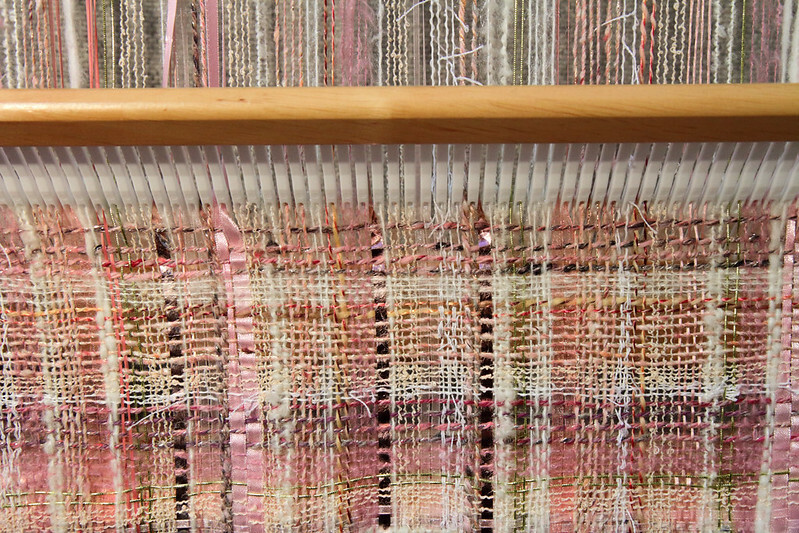 It’s always a pleasure to catch up with Spin City, and their booth was packed full of interesting textures, like this gorgeous Chanel-inspired tweedy weave with ribbons, sparkle and fluffy textures. 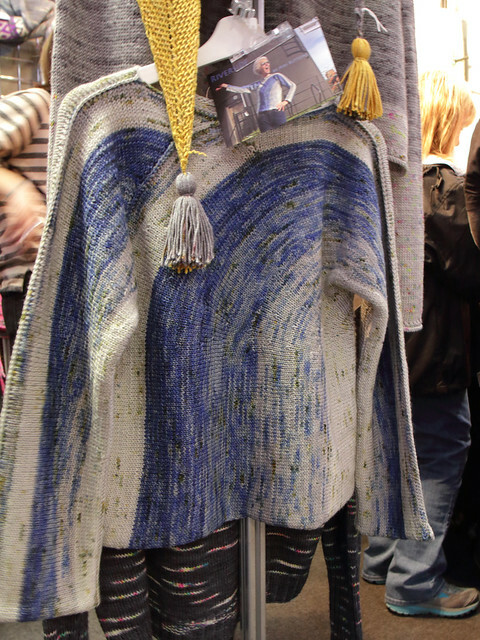 And this piece with a fringe of curly locks. 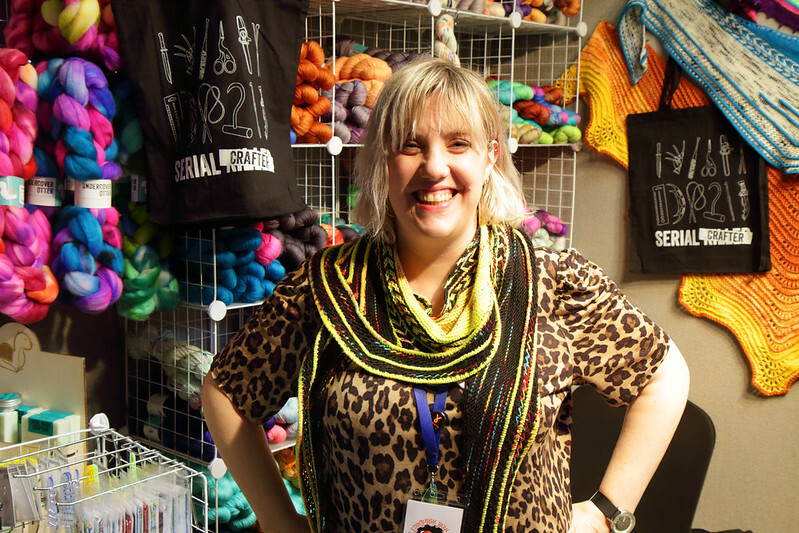 I caught up with my long lost pal Jane aka Yarnison at the colourful Undercover Otter booth. 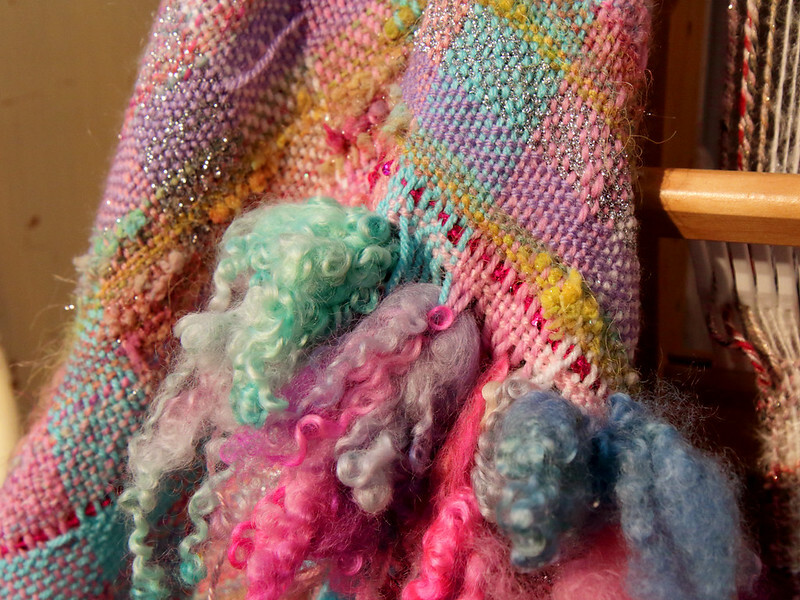 She’s wearing her brand new design, the Armchair Athlete shawl, that uses our Favourite Sock yarn in ‘ZX’. I discovered Mahliqa Wire at Yarnporium when we had a booth located opposite their sparkling pretties. 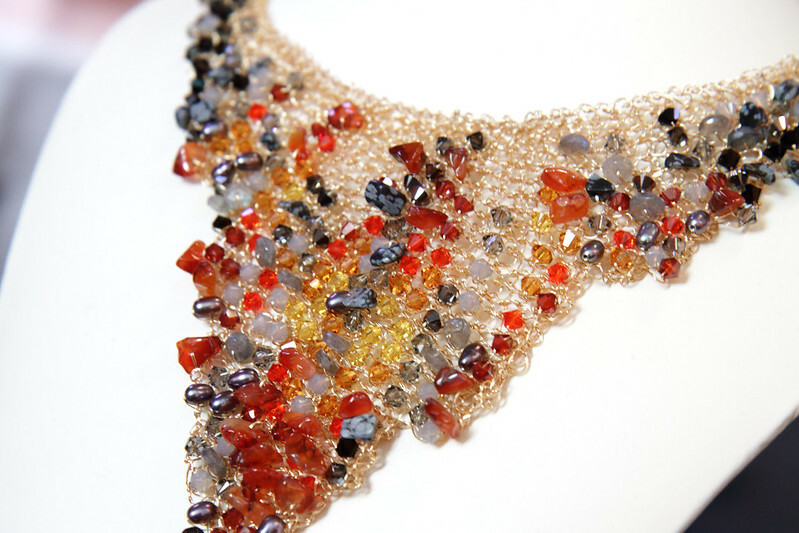 Mahliqa’s unique jewellery is knitted and crocheted from yarn, wire and Swarovski crystal, and they offer kits as well we original pieces. 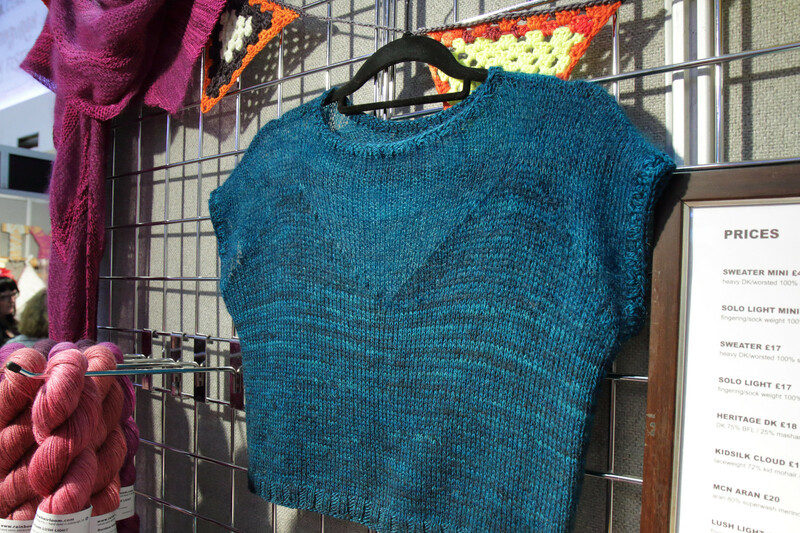 I loved this cute cropped sweater from Rainbow Heirloom that uses fluffy laceweight along with smooth yarn in the same hand-dyed shade with bold intarsia. 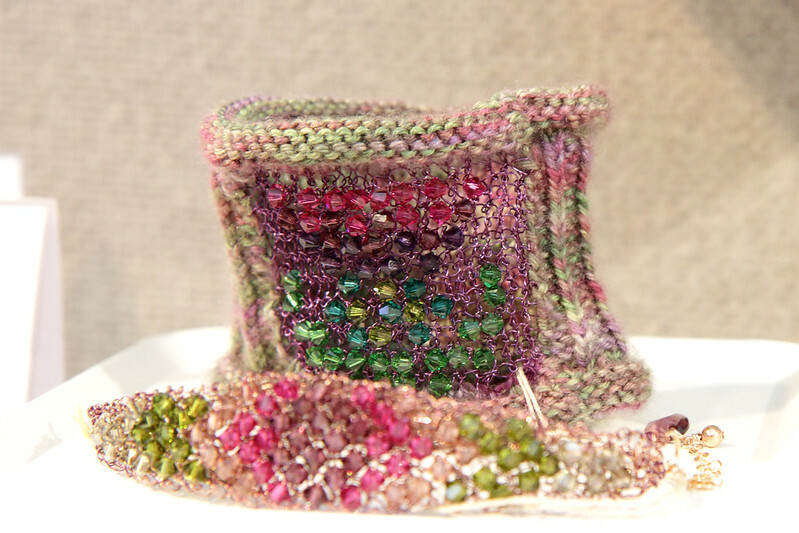 Sadly I didn’t note down the pattern – anyone know? One of the best things about shows is seeing yarn that I rarely get to squish in person, and naturally I wanted to check out the much revered Wollmeise. They had a rainbow of minis and full-sized skeins in super-saturated semi-solids and a shelf or two of painted skeins. Their yarn is exceptionally high quality and I couldn’t resist picking up a skein of their tightly spun pure merino for a pair of socks, and at €22.50 for 150g it was really very reasonable. 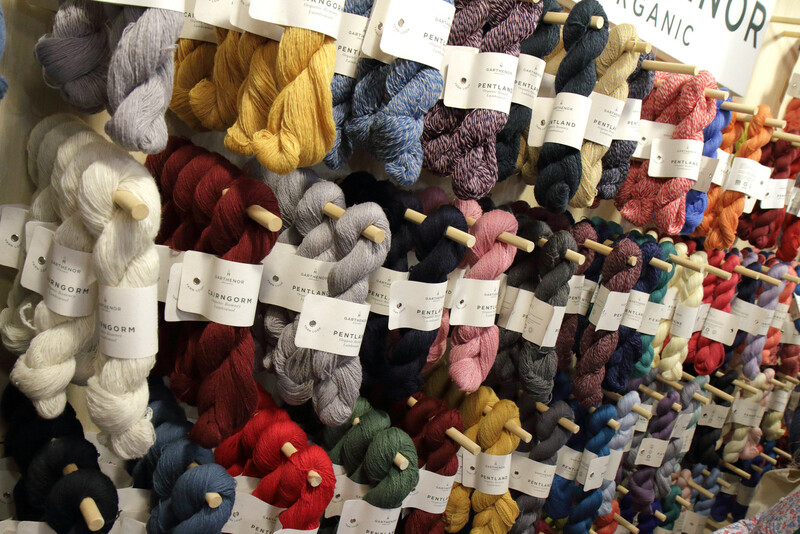 John Arbon launched their new Cocktails sport-weight yarn and tops in a soft wool/alpaca/silk blend. Jill Draper is a new discovery for me from the US. 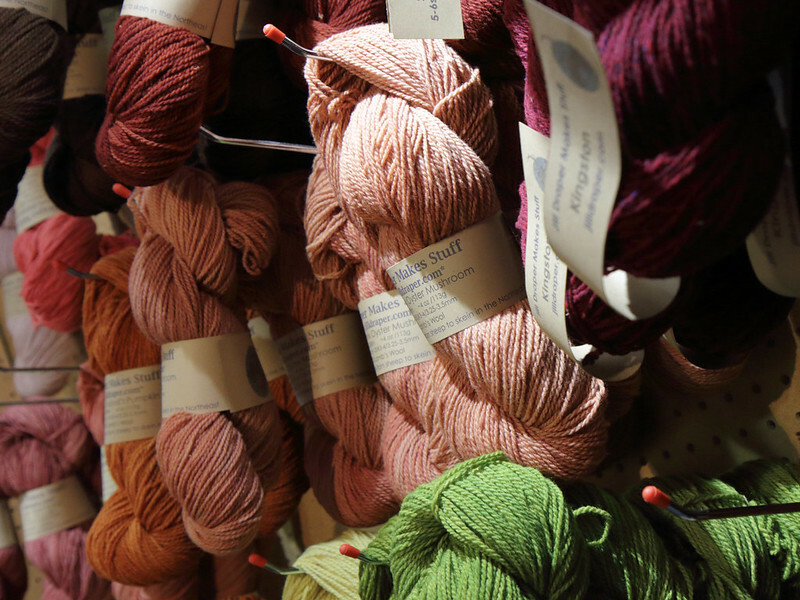 I particularly liked their Mohonk lambsool yarn, which had a lovely, bouncy texture. I am a sucker for wool tweed fabrics, so I was very happy to discover Ardanalish Weavers from Mull. 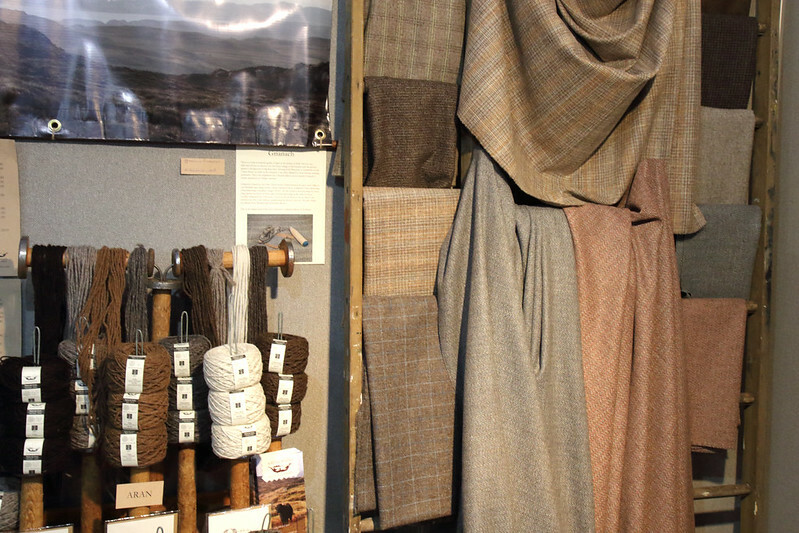 They had a display of weighty wool fabrics which were just a small part of the range available from their website. 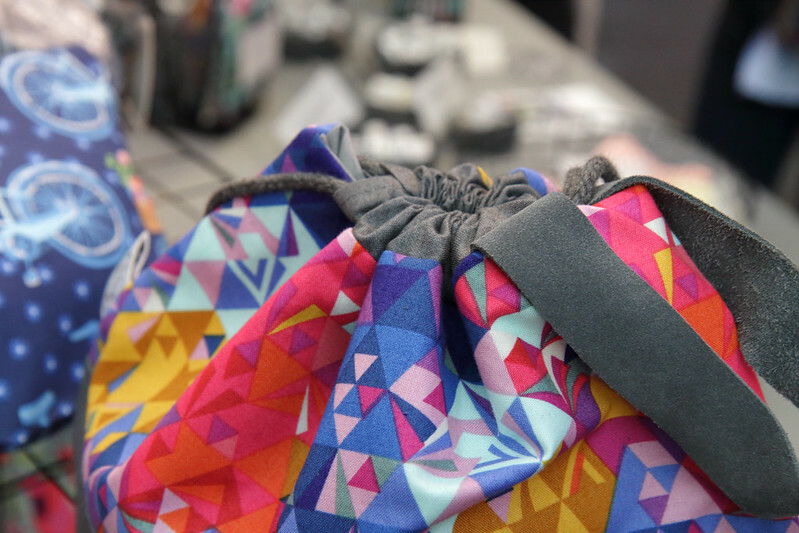 The Little Grey Girl‘s handmade project bags in bold prints are well-loved by knitters. 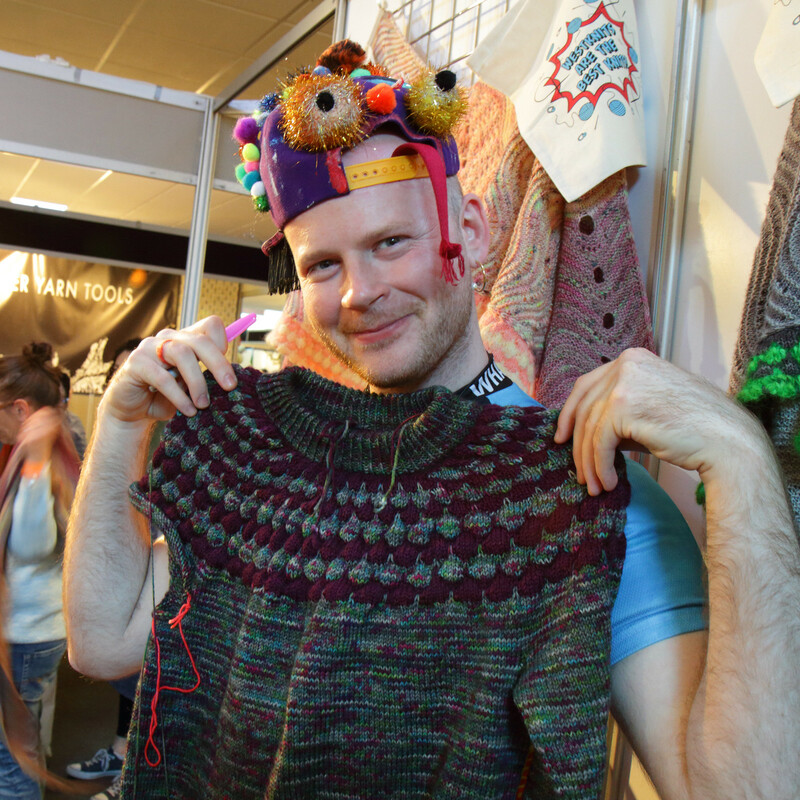 I couldn’t pass by the stand without picking up a smaller version of the design below, which was just the thing for stowing the sock project I brought for the train journey. Garthenor had a large booth showcasing the rich range of textures that our native breeds have to offer, all sustainably farmed. There was so much to see here! Iona Wool really caught my eye with this incredible ‘Postbox Red’ shade, which has an incredible depth on their single-origin oatmeal yarn. 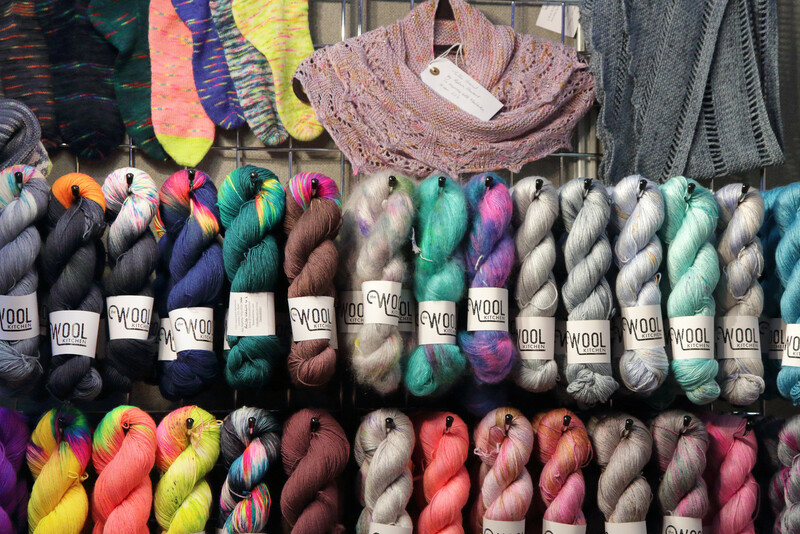 The Westwool is Stephen West’s new yarn brand, making its show debut at EYF. 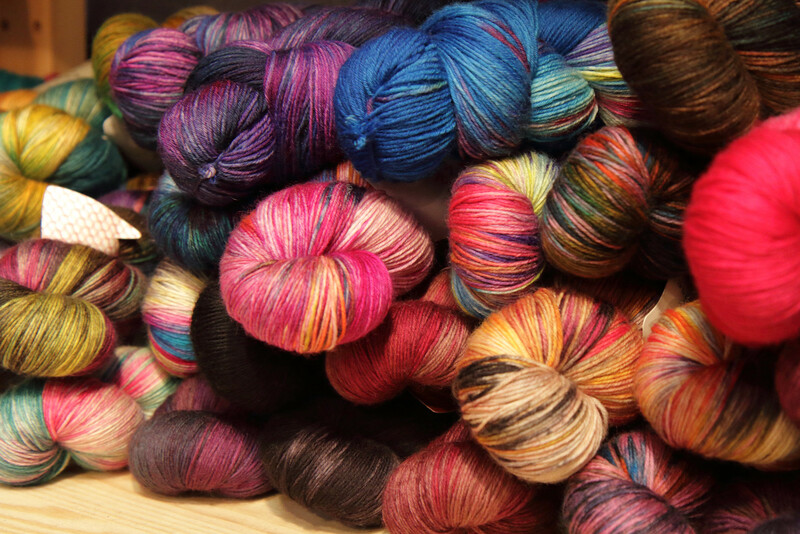 Tandem (DK) and Bicycle (4 ply) are both an unusual blend Merino/Texel blend. 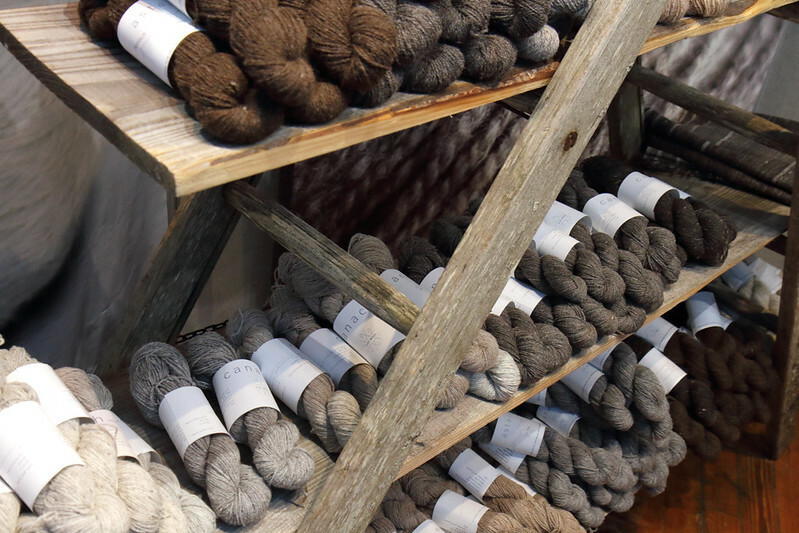 The more rugged Texel fibre adds loft and gives the yarn crisp, rustic edge. 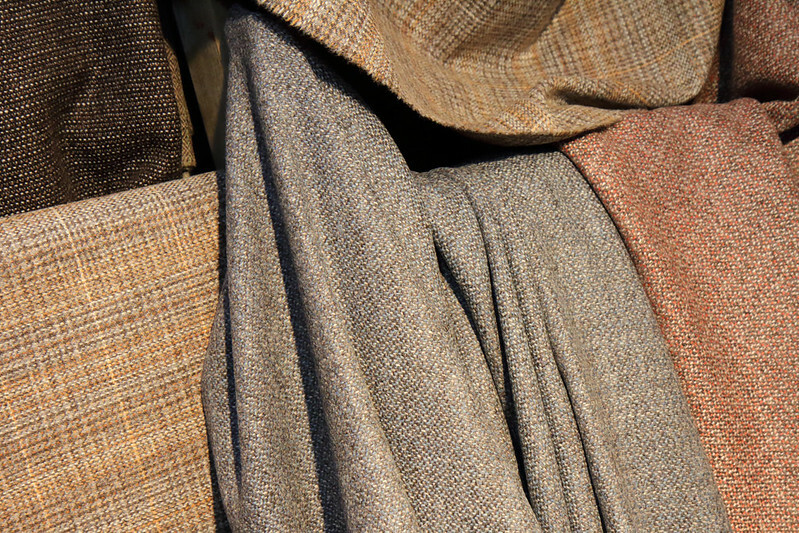 Both weights are available in a palette of 24 contemporary shades.